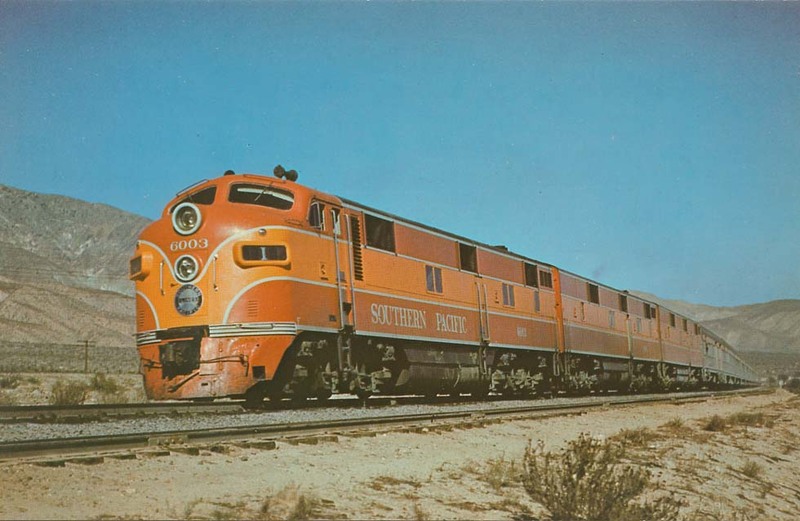 The Southern Pacific via New Orleans was not the shortest route to California. In combination with steamer services New York - New Orleans however it was a pleasant way to travel. From 1894 Southern Pacific did run its seasonal all-Pullman Sunset Limited on that southern route from New Orleans to Oakland. Between 1904 and 1911 it suffered some temporary interruption. In 1913 the Sunset Limited became a daily year-round train and even during WWI it was an exclusive Pullman sleeper express. In 1942 however it was cut back to Los Angeles. Though later being hauled by the semi-streamlined 4-8-4 type GS4 locomotives, it became a streamliner only in 1950, with stainless cars from Budd. 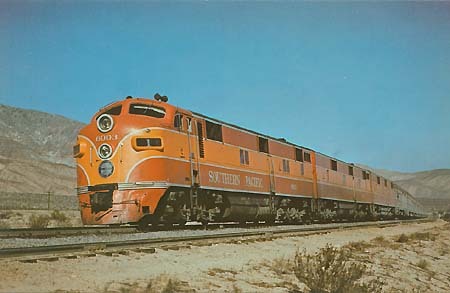 Red/orange E-7 class diesels hauled the train west of El Paso and Alco PA-1's in the east. 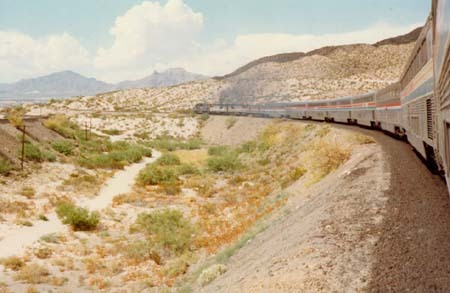 Between 1954 and 1956 the Sunset Limited included a sleeper Washington - Los Angeles from the Crescent. 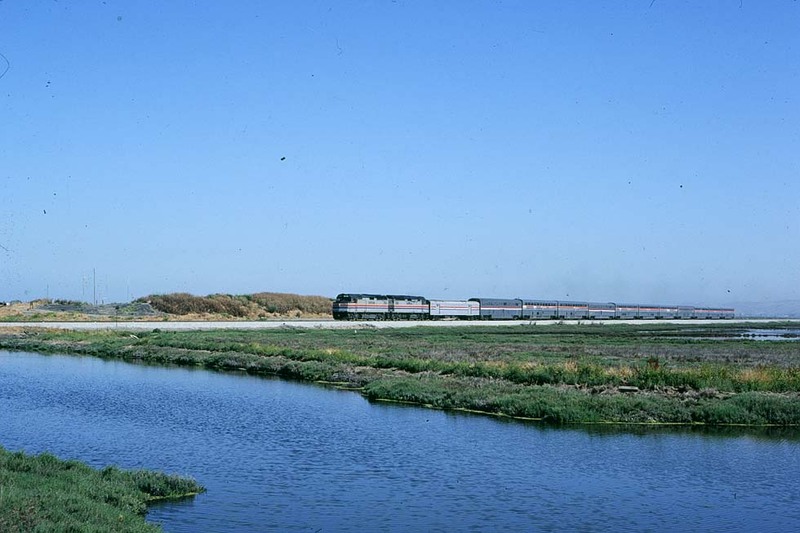 In 1964 the Sunset was combined with the Golden State Chicago - Los Angeles, which ceased running in 1968. Amtrak restored the coast-to-coast sleeper from the Southern Crescent, and the Sunset temporarily returned to Oakland, north of Los Angeles under the label Coast Starlight. Later Amtrak equipped the Sunset Limited with Superliner cars, it was combined with the Texas Eagle Chicago - Los Angeles and in 1993 it even became extended to run Miami- and then Orlando - New Orleans - Los Angeles. From 2008 it was confined to New Orleans – Los Angeles, continuing to be combined with the Texas Eagle. 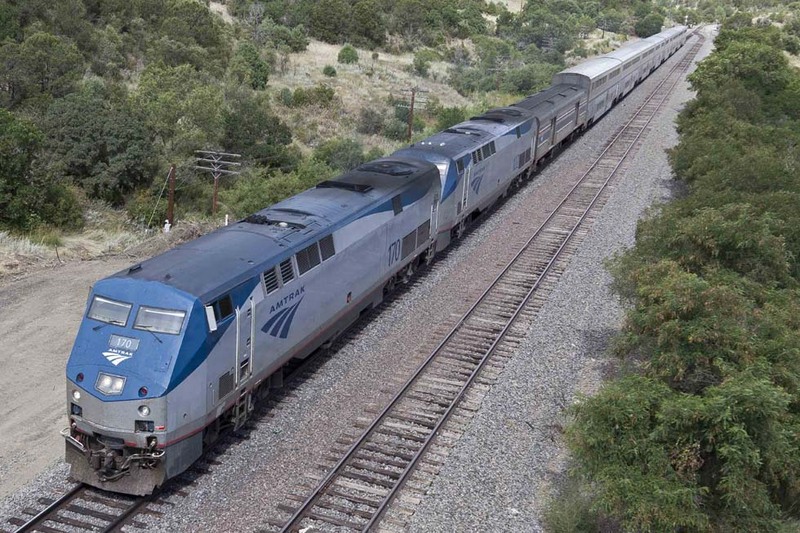 The Coast Starlight Los Angeles – Oakland – Seattle with Superliner sleepers was re-launched in 2008. The bi-level Pacific Surfliner, connecting the port city San Diego, the San Joaquins and The Capitol Corridor are modern day trains operated by Amtrak in partnership with California Department of Transportation. 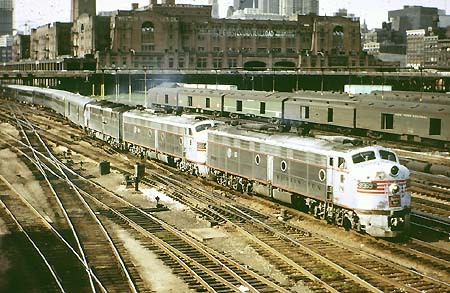 Coast-to-coast passengers used between New York and New Orleans the prestigious Crescent Limited. The predecessor of that train had been inaugurated in 1891 between Washington and Atlanta. Known as "The Vestibule" it was extended to connect New York with New Orleans. 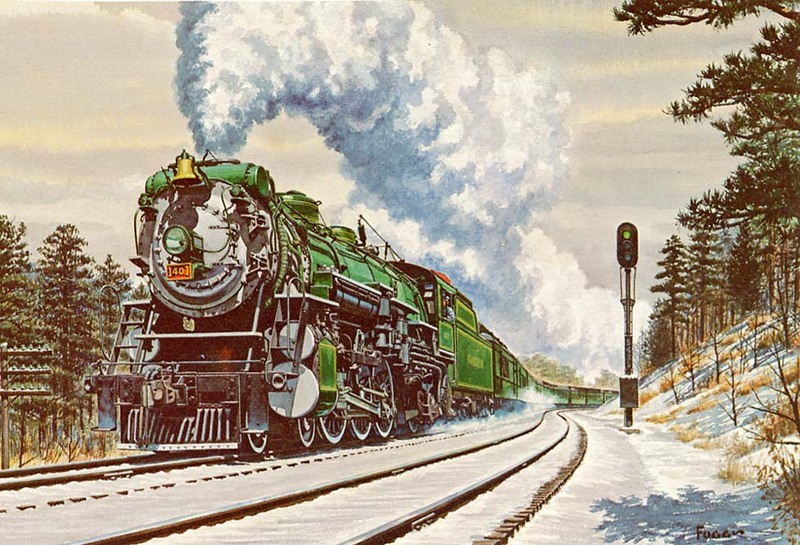 In 1925 the green all-Pullman express became the Crescent Limited, in 1941 it got for the first time white/green General Motors diesels and in 1949 the Crescent became a stainless streamliner. Amtrak continued the service. Of course the way from Chicago or even New York to the West Coast via New Orleans is rather circuitous. 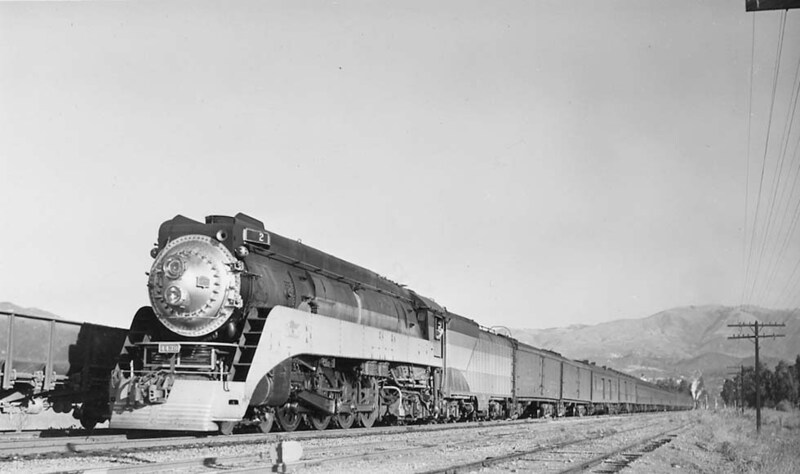 In 1947 a much faster new diesel streamliner of the Rock Island and the Southern Pacific should have been introduced on the route Chicago - Kansas City - El Paso - Los Angeles. That proudly announced Golden Rocket however did not start. 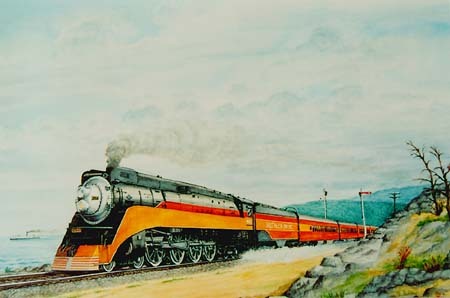 Another train on a route which is not the fastest way to California became America's sensational streamliner with vista-dome cars. 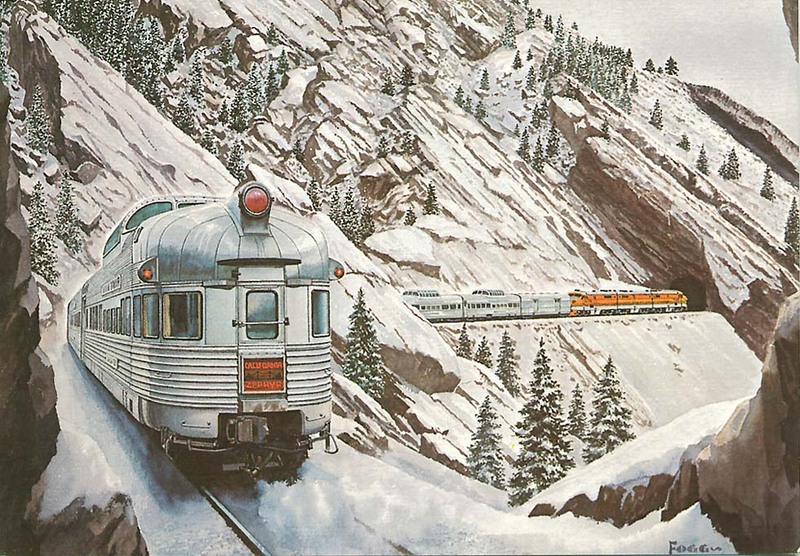 It was the California Zephyr Chicago - Oakland of the CB&Q, known as the Burlington route, the beautiful Denver & Rio Grande and the Western Pacific, introduced in 1949. With its stainless cars and on the Burlington its E-5 engines in sparkling silver it became known also as the "Silver Lady". Already in 1934 the Burlington under president Ralph Budd got America's first streamliner, the Pioneer Zephyr, from the Edward G. Budd plant in Philadelphia. From 1971 the Rio Grande Zephyr Denver - Salt Lake City of the D&RGW connected with Amtrak's San Francisco Zephyr (by limousine service Salt Lake City - Ogden) and in 1983 Amtrak's California Zephyr replaced both trains. 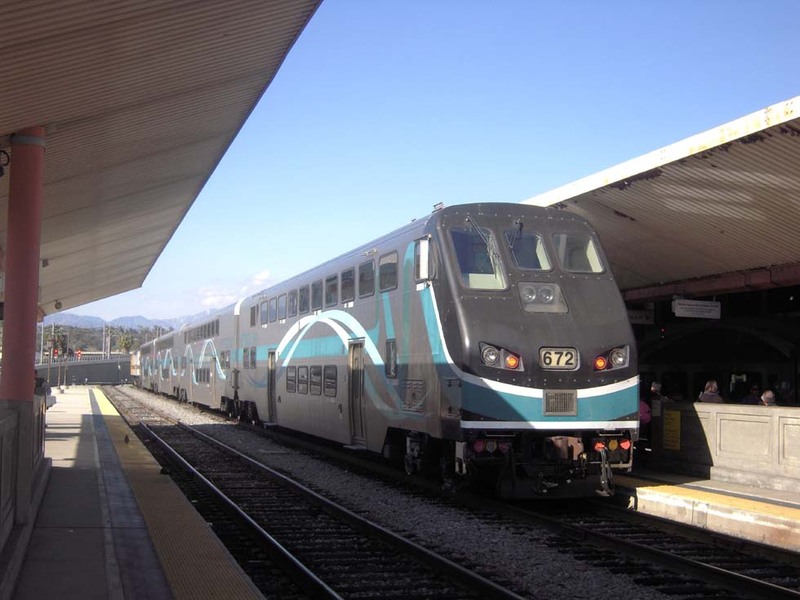 Later its Seattle and Los Angeles sections were withdrawn and the California Zephyr ended at Emeryville instead of Oakland. 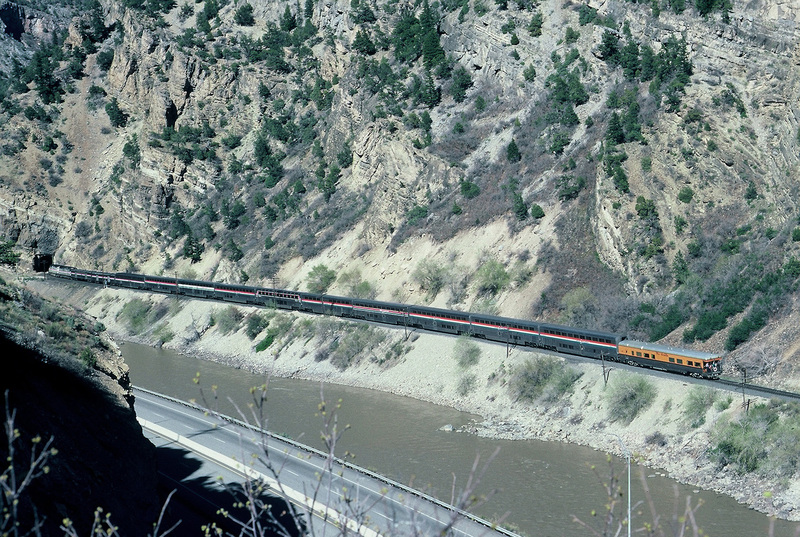 In 2004 it was temporarily diverted via the original Overland route Cheyenne - Ogden. 1 Coach Superliner "Chicago-Salt Lake City-Seattle"
1 Sleeping Car Superliner "Chicago-Salt Lake City-Seattle"
1 Coach Superliner "Chicago-Salt Lake City-Los Angeles"
1 Sleeping Car Superliner "Chicago-Salt Lake City-Los Angeles"
Colors: stainless, locomotives silver, blue/white/red ribbon.